This is my second review of a Jaclyn Moriarty book...but it was the first of hers I read, and it comes before Dreaming of Amelia. Again Moriarty has used unusual mediums of narration, like letters, emails, noticeboard notices, diary entries and Lydia's Notebook. This style intrigued me and I fell in love with it from the outset. Lydia Jaackson-Oberman is the first character we are introduced to. She wants to be a write, and we often see things from her perspective through a book her gather bought her for her birthday, which claims to help people on their way to becoming authors by setting exercises for its user. Lydia is unorthodox and strangely innocent; she seemed to be very childlike, indeed probably the most childlike of the tree main female characters. The other two are Emily and Cassie and the plot revolves around a pen-pal project between the girls' school (the prestigious Ashbury High which is infamous for its reputation of only taking students who have criminal records and being home to several systems of illegal drugs manufacture (though most of the rumours are just that - unconfirmed rumours). Through the letters we see the main events of the novel begin to unfold. Emily is writing to Charlie Taylor, who comes from a large family - his brothers are cops and/or motorcycle gang members while his younger sister Jess is apparently following in their delinquent footsteps - and seems to be a decent guy (pretty perfect for Emily - if only he wasn't dead set on pursuing the girl f his dreams, Christina Kratovac.) Lydia is writing to Seb Mantegna, a soccer player and artist who can look after his baby brother fine, but has anger issues - though the people have always deserved it. He puts up with and indulges Lydia's crazy plans and games - and he's my favourite character. He insists she must be the most beautiful girl in the when she completes several assignments that just so happen to get him out of exams. Cassie is writing to a guy called Matthew Dunlop. Now, though Brookfield is supposed home to a myriad of psychopaths, drug dealers and tattooed bunny-killers, this is where things start to get really dark. In a way, this is why we need the lightness of Lydia and Seb's games, and Emily and Charlie's near constant 'debates'. Because without the other characters Emily's story would be too much, too twisted. Cassie is fragile. Her father died of cancer and she is just picking up the pieces, but Matthew Dunlop takes advantage of her natural openness and vulnerability. 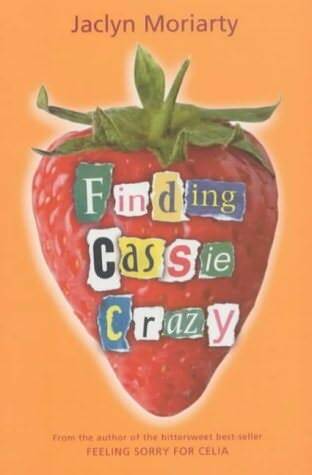 On the outside, Finding Cassie Crazy is bright, interesting and perfectly pitched YA novel. But inside, it has more depth; it is full of laugh-out-loud moments, heart-warming scenes, wise-cracking cynicism, optimistic innocence and kick-arse characters. However, it also deals with many issues in a way that makes you think the story could not be told any other way or by any other author. It manages never to get too dark, though at times you think it might - you're worried something much more horrible is going on. It's definitely worth reading. Sometimes I thought some characters or situations were a little unrealistic, and I just wanted to skip to another set of letters/notes/etc, but otherwise it's an excellent read. I love it and my well-thumbed copy is sometimes exactly what I need when I just want to chill with an old favourite. In l4ess than five words: gorgeous, brilliant, charming, funny, cool.